My overwhelming desire to wander the globe often gives people the wrong impression of me, making me appear more free spirited than I actually am. I suppose I’m a free spirit in many respects, but in others I’m every bit the homebody who loves routine and goes to bed by 9 pm. (Yes, you read that right. In my defense, I automatically wake at around 5 am—no matter how hard I try to sleep in—so if I don’t go to bed early, then I suffer all day. An early bedtime is a matter of survival.) I’ve often mentioned my love of routine, and I wasn’t kidding. It sets a rhythm for my life that I find both enjoyable and relaxing and makes me feel like I’m “at home,” no matter where I am. So, to satisfy the stodgy 80 year-old in me, I immediately set about creating a routine to help me feel comfortable in my new short-term home. I present to you Exhibit A. The television. 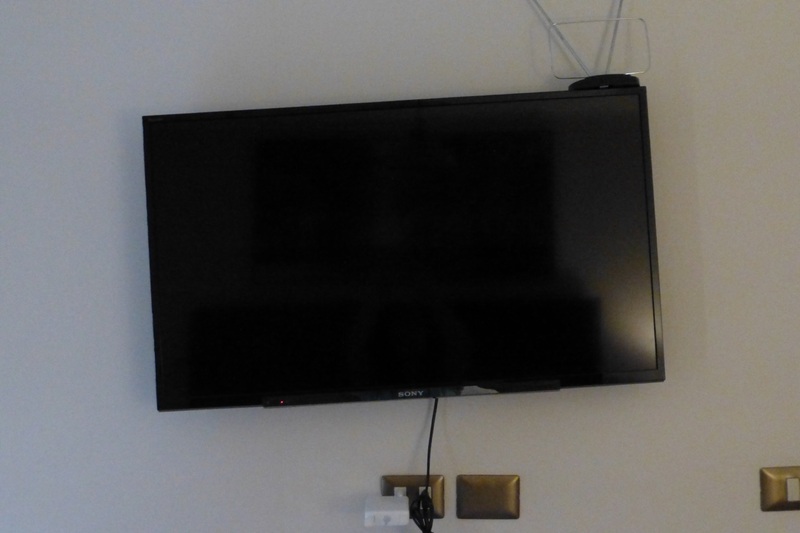 The Airbnb I’ve rented is a small, but modern apartment in central Santiago and it’s been perfect in every respect save for the the TV that was mounted crookedly on the wall. When I first saw it, I thought “It’s a good thing I’m only mildly OCD,” and then I resolved to ignore it. However, between you and I, I confess it occasionally catches my attention and makes me wonder what sort of person allows this to go on in the world. Doesn’t it seem just a tad sadistic to leave it hanging askew, taunting tenants who endlessly try to adjust something that cannot be adjusted? It’s subtly diabolical. Touche, apartment owner. Because of the apartment’s location in a central part of downtown, my workdays are punctuated with sounds of the city, which are not nearly as quaint as other places I’ve been. These are made up mostly of construction noises, sirens, and during high-traffic times, the ubiquitous car horn. I’ve noticed Chileans are very liberal in their application of the car horn, a practice I’ve never quite understood when the only emergency is bumper-to-bumper traffic. To a writer, it’s like using an exclamation point at the end of every sentence; at some point, it just loses the intended effect and becomes annoying. Views of Santiago. I love being in a city surrounded by mountains. 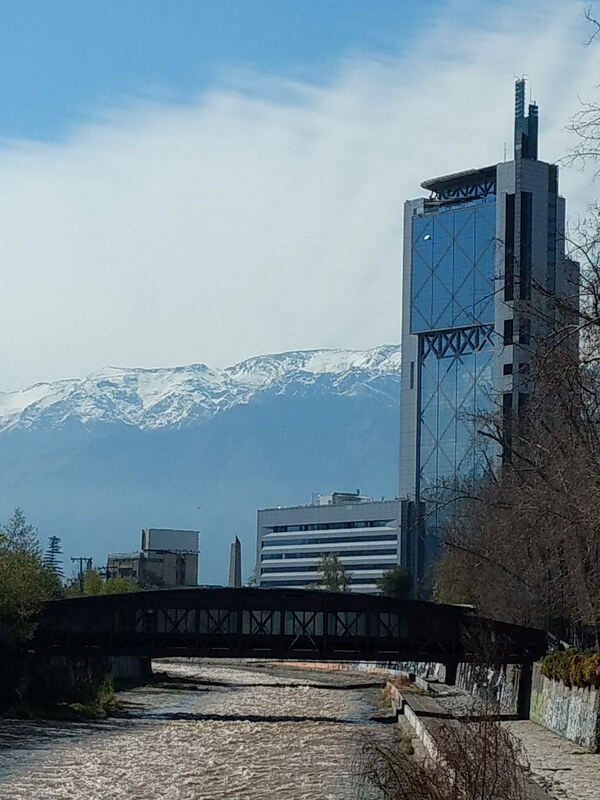 Santiago is four hours ahead of my normal time zone, so my daily work routine is similar to what it was in La Paz; in other words, my entire morning is my own and I don’t begin working until about 11:30. Typically, my morning starts with some form of exercise. I’ve discovered that running in a densely populated city is more like a game of dodge as I attempt to avoid the random swarms of people rushing to their job, or the pop-up stands of people selling sandwiches or fruit from little makeshift tables, similar to what you might see at a church bake sale. As in most South American countries I’ve visited, the underground economy is thriving and people are creative about making money. When I’m not dodging locals and sandwich stands in my running shoes, I’ve continued my dogged search for decent coffee. I make it a goal to visit several new cafes a week, yet my search has still yielded no fruit. I believe the local palate has been so ruined by Nescafe that they don’t realize the coffee scene leaves much to be desired. After I am sufficiently exercised and caffeinated, I attend to errands and chores and occasionally meet Fernanda for lunch. As coincidence would have it, she works near my apartment. Having a new friend in the city has really made this experience richer. As you can see, the work week is incredibly mundane and isn’t so different from anyone’s routine all around the world. For me, the difference lies in the weekends, which is when the sightseeing and real fun takes place. 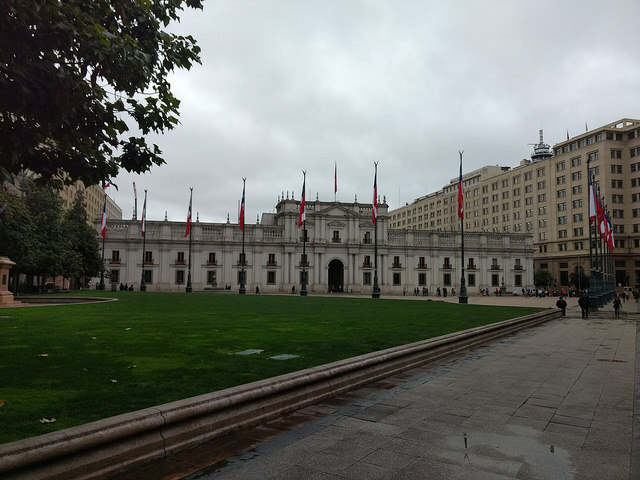 So far, I’ve filled my weekends with hikes, arts centers, wine trips (more on that in another post), and trips to the museum, such as the Memory and Human Rights Museum, which details the events of Chile’s own “September 11” — September 11, 1973, that is, which is when a military coup toppled the government, after which followed a dark period in Chile’s history, including 17 years of military dictatorship and human rights violations. It wasn’t until as recently as 1990 that Chile democratically elected another president. This past Sunday, over a leisurely afternoon filled with wine and seafood, Fernanda shared an interesting perspective on this period of history, which I fear I would not do justice by attempting to explain it. I mention it only because having a local’s perspective, combined with being in the city where it happened—seeing the palette and the canvas even though the brush strokes have long been painted over—makes history come alive in a way that cannot be reproduced by books or in a classroom. In my humble opinion, travel is always the better education. And now I must continue the routine as I prepare to visit another cafe. Surely my efforts will pay off at some point in this trip.